Cleaning your plumbing pipes safely and effectively means using a power jetter, also called a hydrojetter, but which type do you choose to clean your sanitary piping? Power water jetters are fueled by either gas or propane, and when you choose a contractor to clean and restore your plumbing pipes, do you choose one that offers gas power-jetting or one that has a propane powered-jetter? Gas-Powered Jetters use gas to power an engine that propels pressurized water through sewer lines. While gas powered jetters do their jobs effectively, clearing dirt, debris, grease and clogs from the sewer lines without damaging the pipes, they can be environmentally hazardous to operate. The same fumes that emit from a gas power car are also released during combustion in the gas powered-jetter. For this reason, gas powered-jetters should not be taken into buildings, and if the particular city where the sewer cleaning company resides has strict emission laws, gas powered-jetters may not be able to be operated on ozone action days. These jetters are powered by propane, which is a cleaner burning fuel. Like gas powered-jetters, propane powered-jetters have the ability to clear clogs, grease, dirt and debris from sewer lines without damaging the pipes, but the cleaner-burning fuel has two distinct advantages over gas powered hydrojetters. Since propane is a cleaner burning fuel, propane hydrojetters can be used at any time, even on ozone action days. This is because it is estimated that they produce only .003 polluting particulate matter. 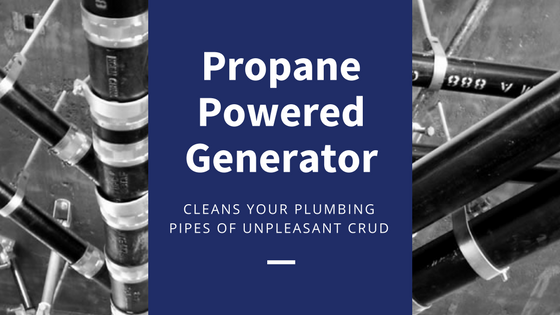 Propane jetters emit 36 times fewer pollutants into the air than their gas-powered counterparts, they can safely be used indoors to clean a variety of drain lines, including the drain lines connected to toilets, sinks and showers. Here at Nu Flow, we offer propane jetters for the cleaning of sewer and drain lines before we line those same pipes with an epoxy liner. We choose propane powered-jetters because of their environmental friendliness, and because we know that when your pipes need to be cleaned and lined, you need the service performed as soon as possible, even if the environmental conditions have resulted in an Ozone Action Day for the city of Chicago. To learn more about how cleaning your plumbing pipes with a propane powered-jetter before pipe lining is better for your pipes and the environment or to schedule an estimate for pipe lining, call us at 815-790-9000.